This is published by Action for Happiness, probably the biggest UK network focussed on happiness. 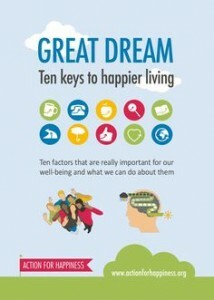 It may be stretching things to call it a book; it’s a 28-page free download from their website, www.actionforhappiness.org. Along with the ten keys, all helpful, the book suggests ways to use them, for example creating a local group, or sharing them with a work team. What’s missing for me is cues for a deeper, more systemic exploration of ways to handle bigger issues in one’s own life and the wider world. Although exercise is one of the keys, contact with nature as a source of relaxation or insights is not mentioned. And the Resource section is highly academic, at odds with the basic tenor of the book itself. What has helped you bounce back from difficult times before? · Ask for help today. Confide in a friend, talk to an expert, reach out to a colleague, ask a neighbour to lend a hand. · When something is troubling you, do something you really enjoy. Shift your mood and bring a new perspective on the problem. This is useful as a very basic intro, but no more. There are better resources than this on the Action for Happiness website.